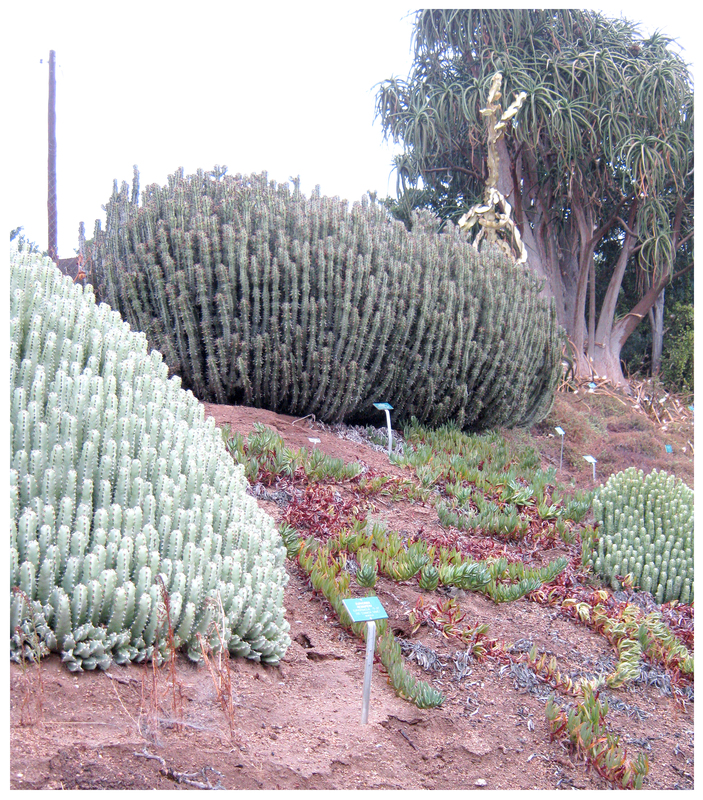 For me, no visit to the UCR Botanic Garden is complete without visiting the desert garden area. 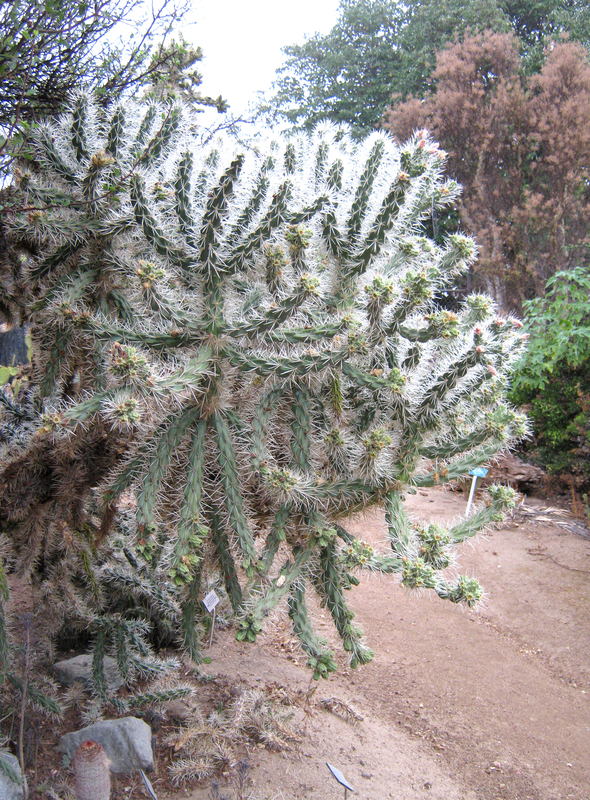 Last Sunday’s visit was no different, and in the morning’s drizzle the succulents and cacti there were especially beautiful. 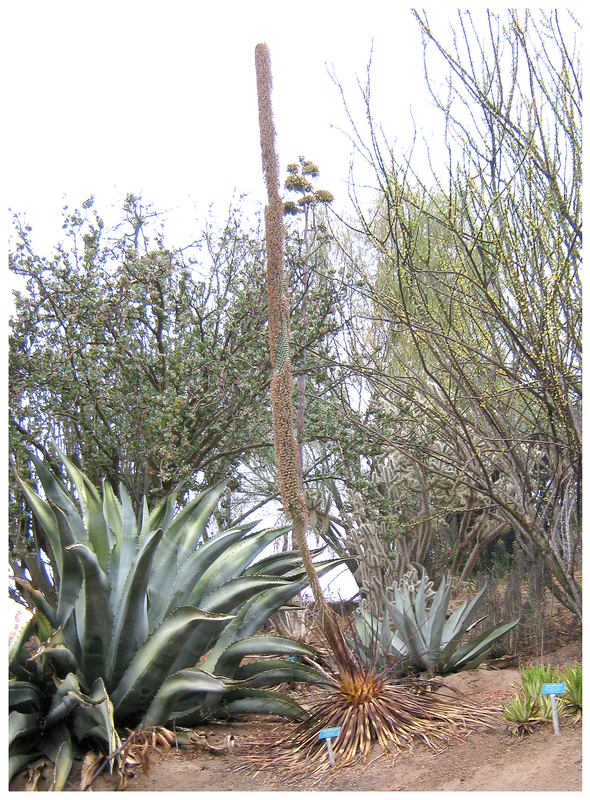 Two agaves shawii were demonstrating distinct phases in their life-cycle: the pre-blooming period, and the period after blooming. Local succulent expert Buck Hemenway recently commented, referring to my agave potatorum after it had bloomed: “These plants [agaves] are amazing. Imagine, all of that energy to produce the bloom stalk, flowers, seeds, etc., all from stored energy. It stop(s) taking nourishment from the ground when the bloom stalk started up. 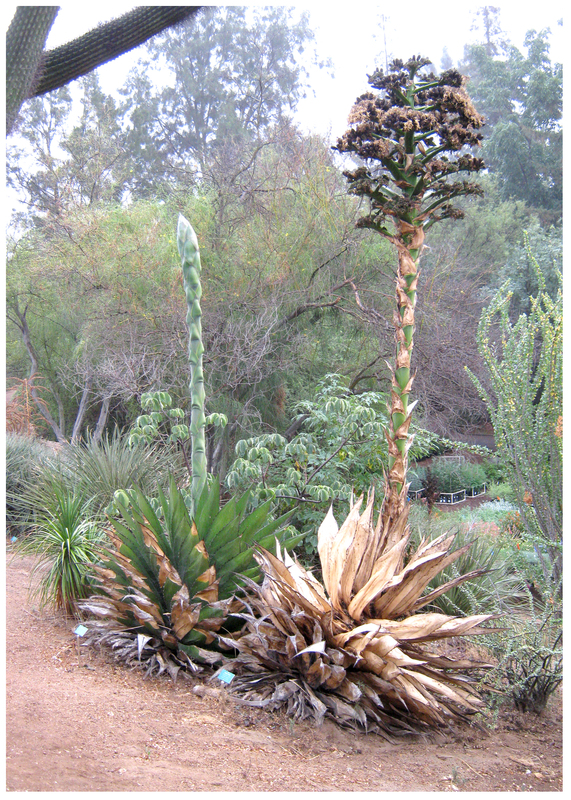 That also means that the roots are not very well anchored any more …” In this opening picture, the agave on the left has expended the energy required to produce its characteristic flower stalk, this one over 10-feet tall and very thick; on the right the blooming cycle has ended and it’s clear the expenditure of energy has taken its toll. The agave’s leaves are all but dried out completely, and the stalk and the flowers that top it are in process of decaying. Sad, really, but also a wondrous demonstation of the agave’s pattern of life. 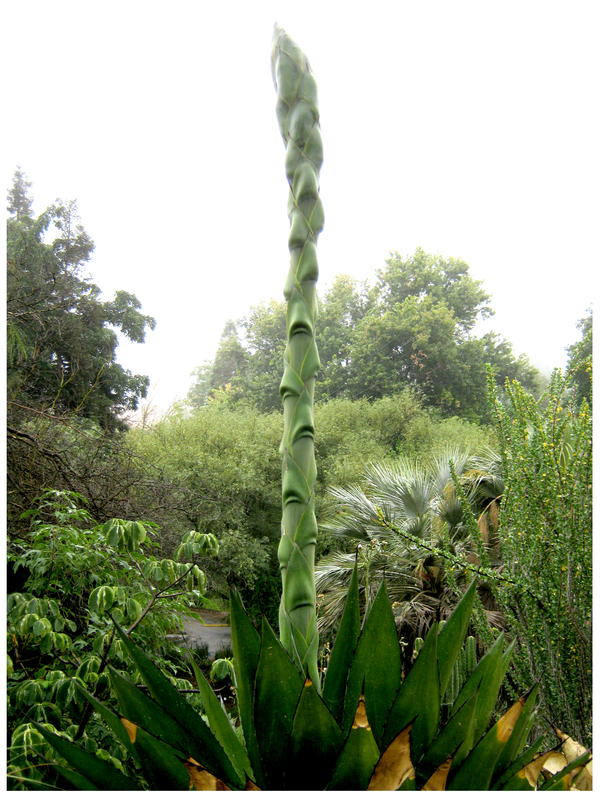 The agave shawii’s flower stalk looks like energy itself. Its strong upward movement and great height are stunning. Walking up and having this enormous stalk tower over us was awe-inspiring. 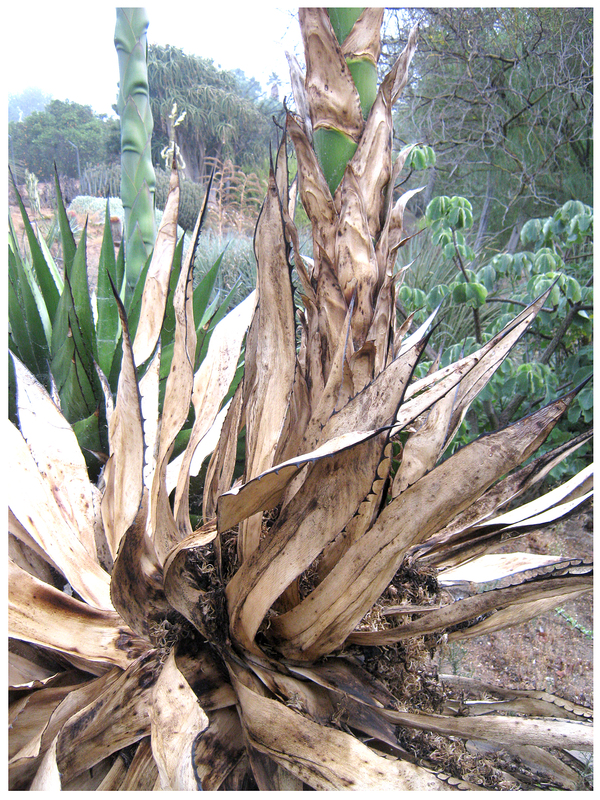 Even as the spent agave’s base leaves become more and more dried and brittle, they retain a sense of their earlier power and beauty. As Buck pointed out in his comment, the agave’s hold and support gives way eventually 0nce the stalk has grown and then bloomed, and I expect this one will topple over from its weight very soon. 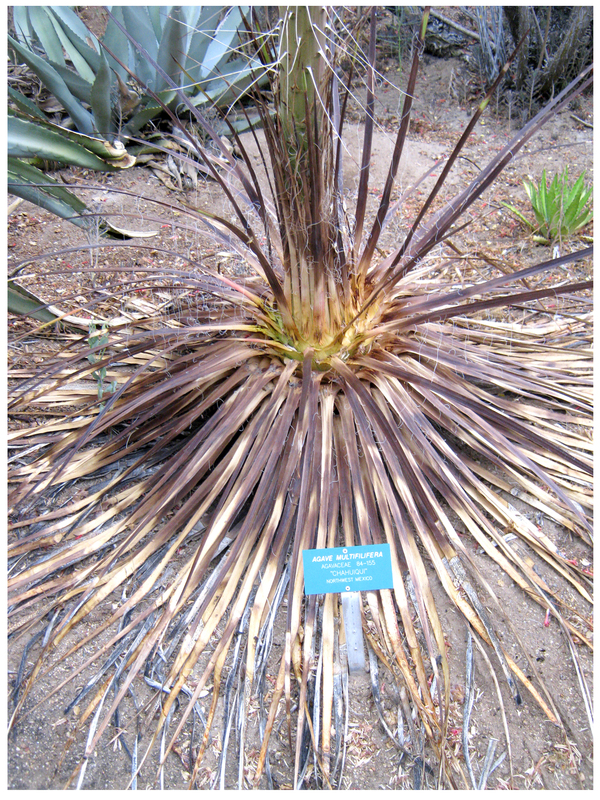 Another nearby agave, this one an multifilifera, is past its blooming cycle. 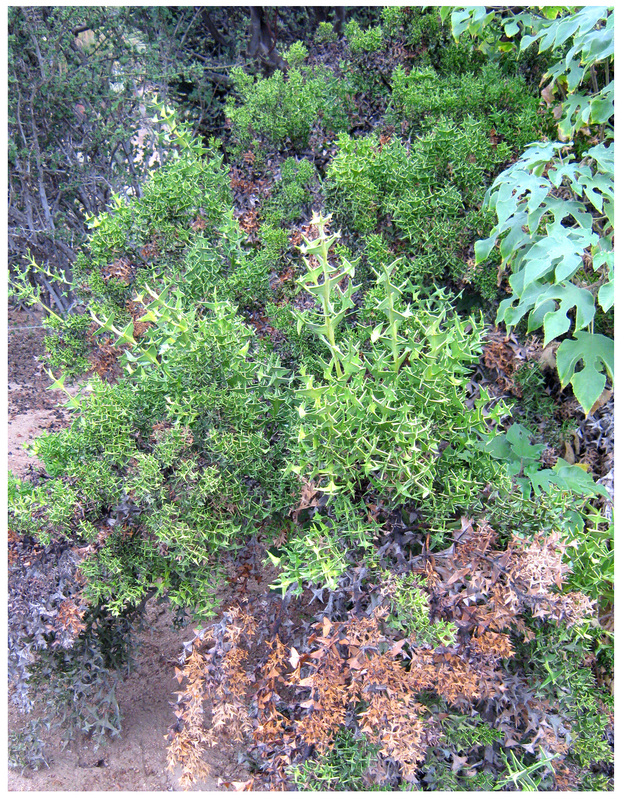 Its dessicated leaves are splayed and clearly spent. It’s stalk, while thinner than the shawii’s, is surprisingly taller — by far. The dead leaves have the look of fine tortoise shell and are really gorgeous. 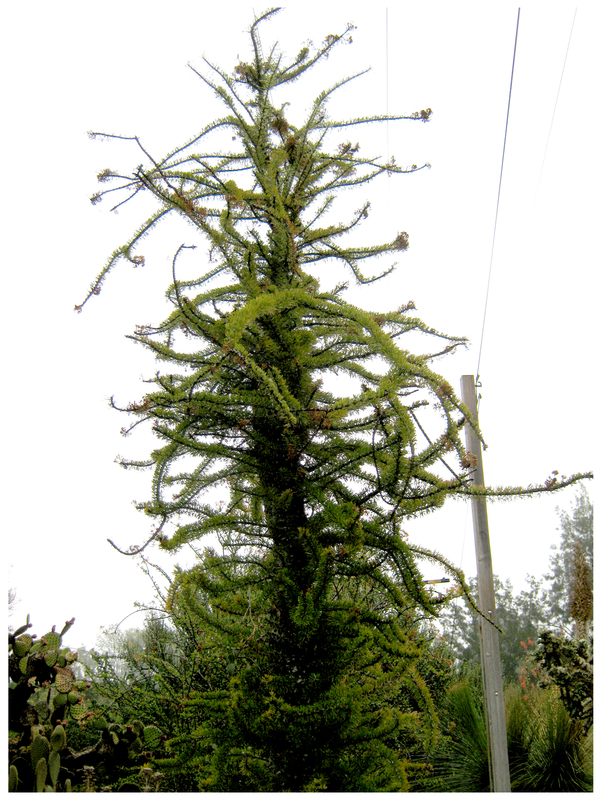 The multifilifera’s flower stalk, in relation to its leafy base, is almost alarmingly out of proportion. It’s hard to believe that the much smaller, shorter base could have produced this prodigious bloom stalk. 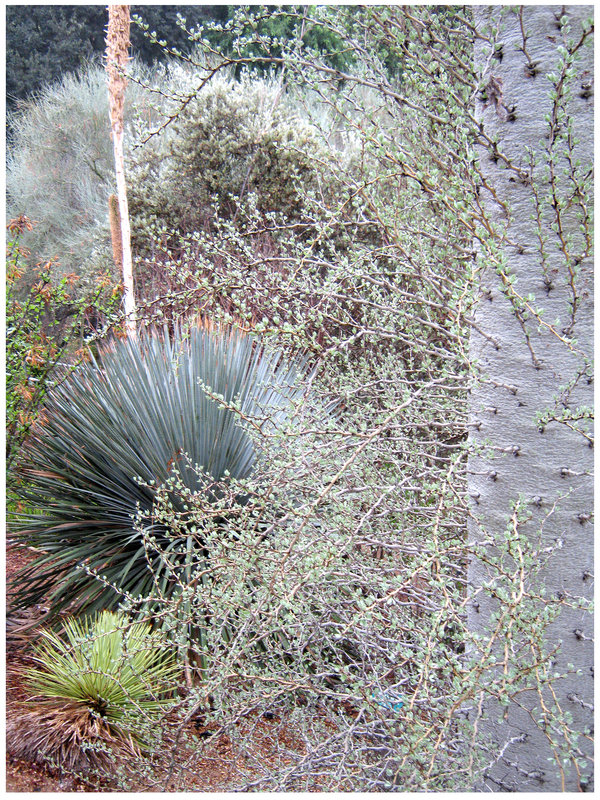 One of my all-time favorite plants is commonly called the boojum tree. 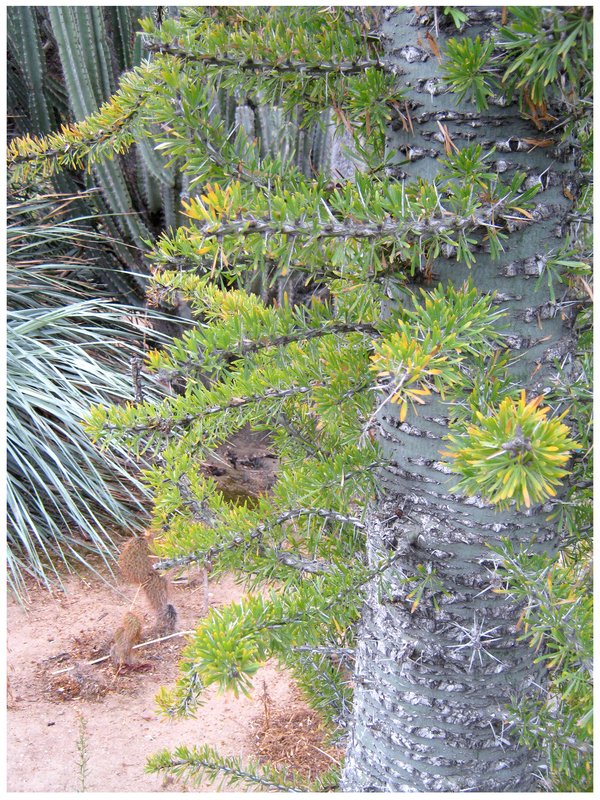 Part of the fouquieria family of plants, its specific name is fouquieria columnaris. This particular example is native to Baja California and Sonora, Mexico. A little bit Dr. Seuss, and partly prehistoric, the boojum is just a tad wacky. With a very tall conical trunk that looks like poured concrete to my eyes, boojum seems to have random branches from some other plant stuck into it willy-nilly. I would estimate this plant to be at least 15 feet in height. Standing next to the boojum, I feel like I’m in the presence of plant-life from a primeval time … one where early humans spent their spare time studding the boojum’s bare trunks with twigs that then sprouted tiny leaves. You know, a wackier time — long, long ago. 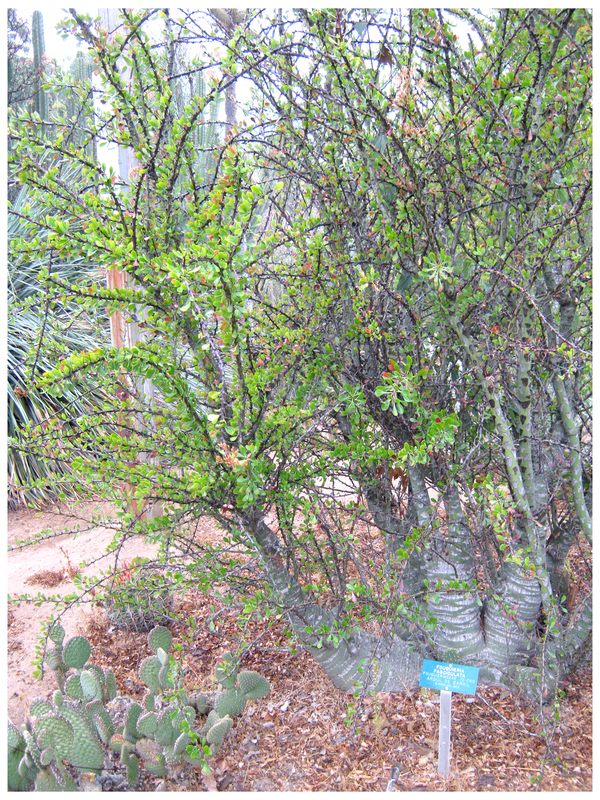 Speaking of wacky, this fouquieria cousin called fouquieria purpusii has branches that are positively spazzing-out. 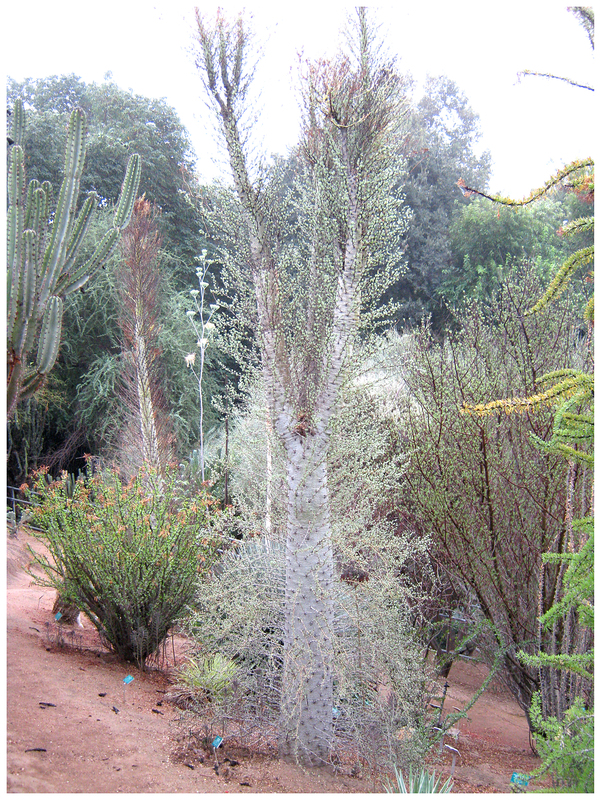 Like the boojum, it features a central trunk with branches projecting out the sides. It’s also very tall, I’d say at least 20 feet. From Mexico, this variety can be found in the states of Puebla and Oaxaca. Like its cousin boojum, the purpusii’s trunk seems to be made out of stone or concrete, in this case a very textured and striated version. But, it’s the branches I really love. They stick out of the sides like the branches of those bottle-brush Xmas trees we had in the sixties, the ones that would get all bent and twisted between holidays due to being put away hastily, say, in March. Or, is that just me? From the more exotic South American countries of Brazil and Uruguay comes this fantastic plant called colletia cruciata. This was a very large low-growing shrubby mound and had some portions that were dried and brown. But getting up close to it I was astounded by its remarkable foliage and growth pattern. Looking very much like molded plastic, and with the same rigidity and strength of same, this plant was unlike anything I’d seen before. Obviously, its name cruciata, referred to the cruciform, or cross-like effect of its, er, leaves … though if they weren’t bright green, and maybe blue, or shocking pink, or yellow, I don’t know what I’d call them. Very space-age, this one. Rounding a corner on the path, we were confronted by this cylindropuntia pallida. Very branch-y and covered with really long, really white spines, I was glad there was plenty of room to navigate around it. The sun was hidden behind low cloud-cover Sunday morning, but its light was filtered quite nicely through the long, translucent prickles. Now that the weather’s cooler and hiking’s less of a chore that requires carrying water and resuscitation supplies, it’s the perfect time to visit the UCRBG … Oh!, and don’t forget the Fall Plant Sale this weekend! I’m not sure if boojums will be available this time around but I do know there will be amazing plants at terrific prices. And, become a Friend of the Botanic Gardens. You’ll help support the Gardens and get in early for plant sales, get invited to fun garden functions and more! AND it resembles a stalk of asparagus on steroids. A lot for one plant to do! Totally agree… we had an agave in Long Beach produce this amazing Jack-in-the-beanstalk asparagus tip once, too, and I had never seen one before. I think that might’ve been when I went truly nuts for these plants! The agaves really have it all — sculptural gravitas then a spectacular end, providing their own fireworks. The boojums — what a great contrast to agaves! Absolutely no symmetry, they remind me of the faux pine tree cell phone towers. 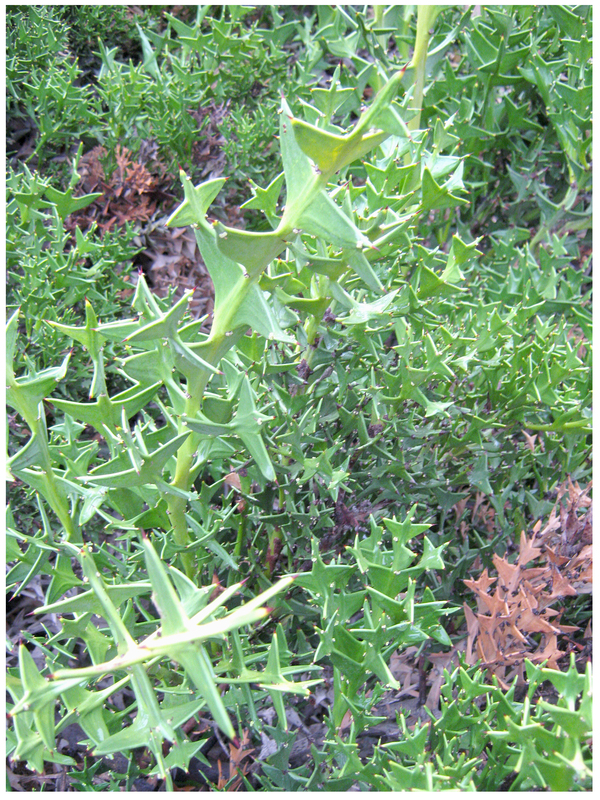 I’ve heard that colletia referred to as the ‘anchor plant.’ Seeing this place in cool temps is really the way to go. Can’t wait to pay it a visit. You’re right, Denise … thanks to the Botanic Garden’s helpful little placards, it was noted that the colletia was called an anchor plant. I love your comparison of the boojum to the cell towers, too… why didn’t I think of that?! This is my favorite RR post ever! (well, for today at least)…such beauty. You’ll be going to the plant sale, right? Thanks, Loree! Yup, I’ll be at the sale fer sure! How clueless I feel..didn’t even know UCR had a botanic garden. Looks way way cool. On the list for the next time I venture south..
UCRBG is definitely worth visiting, Kathy … you’ll enjoy it, I’m sure. Did you go to the plant sale? I didn’t go until late Sunday morning (had to work), but I’m usually the first on line on Saturday morning for the pre-sale (Membership has its privileges!). They still had a really great selection, so I’m guessing it wasn’t very well attended. I bought so many plants, I was a little worried about what my husband would say. At least it was for a good cause, right? We did go, early since we’re ‘Friends’ too, but I wasn’t at my best. I’d had a tooth pulled on Friday and wasn’t feeling the greatest still. We got a few things but not enough for a full-on blog post. We bought, mostly to support that good cause, as you mentioned. There were shoppers but it did seem somewhat low-key … Nice to know you were there to pick up the shopper slack! Boo&hiss@ tooth pulling. Hope you’re feeling better. I want a Fouquieria purpusii! It’s totally twisted; love it!